Secret sharing allows a secret s to be distributed amongst n participants in the form of shares. An authorised set of these participants is then able to reconstruct s at a latter date by pooling their shares. Secret sharing with cheating detection capability (SSCD) allows participants to detect the submission of faulty or modified shares. 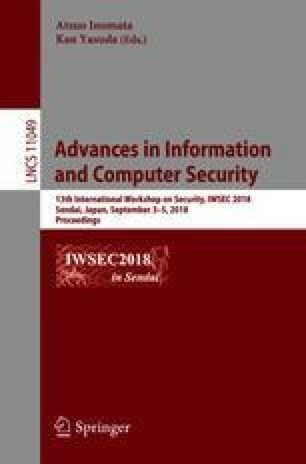 Within this field researchers consider two different models of security, the OKS model and the CDV model. In SPACE 2015 Jhanwar and Safavi-Naini (JS) presented two SSCD schemes, one developed under each of the security models. We prove that both of these schemes fail to detect cheating. We then show that with some modifications both schemes can be made secure. The resulting schemes have near optimal share size, support operations from an arbitrary finite field and provide a high level of security even if the secret domain is small. The first of these schemes is devised under the OKS model and is the most efficient of its kind, whilst the second is devised under the CDV model and is as efficient as the current best solution. L. Cianciullo—This research is supported by an Australian Government Research Training Program (RTP) Scholarship.